According the New York Times, opening arguments did go forward today in the James Arthur Ray trial. But whatever happened in that regard did so after In Session's trial coverage wrapped for the day. Instead, I watched a lot of the pregame show but an as yet unspecified problem with the jury delayed pretrial hearings and the beginning of the public trial. Here is a brief encapsulation from the Times. A prosecutor, Sheila Polk, argued that Mr. Ray’s negligence caused the deaths of Kirby Brown, James Shore and Liz Neuman in October 2009. She said Mr. Ray conditioned the victims to put aside their inhibitions and trust him as a way of reaching enlightenment. 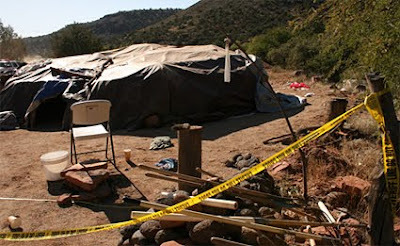 Luis Li, Mr. Ray’s lawyer, called the deaths accidental and said the victims had voluntarily entered the sweat lodge. Mr. Li said that the victims were adults and had made their own decisions and that Mr. Ray held no power over them. So, maybe they'll play recorded footage of these remarks tomorrow. I'd like to hear them. Today it was all commentary and an attempt to put the trial in context. Much of it was completely nauseating. I indulged in a little running commentary here. But there was very little in terms of in depth analysis; at best a little food for thought. Sunny Hostin comes off as a breathless star-fucker. She just sounds incredulous that someone associated with that "incredible" book The Secret and as famous as Ray could be facing these charges. Beth Karas, in discussing the sweat lodge structure, claims the construction was overseen by a Native American named David Singing Bear. This is to explain that though it looks makeshift, it was actually a traditional structure. Throughout this discussion, she never refers to any tribal history but uses the generic term Native American repeatedly. Well, I had never heard of David Singing Bear so I used the google. There are some questions regarding his authenticity. I don't want to jump to any conclusions but there is not a lot of information to be found... Really, that's the problem. There is very little information on his background... on his own website. In looking at his bio, it all seems a little vague. He lists a number of degrees, without naming a single school. He claims a Doctorate of Divinity but doesn't list the school. He also claims to be a Doctor of Metaphysics but I can't even think of an accredited institution that would offer such a thing. He says he's a Licensed Minister but doesn't say in what faith or by whom he was ordained. He claims to be a Licensed Mental Therapist. What does that even mean? I've never known of any mental health professional of any kind who called themselves a Mental Therapist. He claims to be a Vietnam Vet but never says what branch of the military or what unit. Anyone -- at least of a certain age -- can claim to be a Vietnam Vet. It's hard to prove otherwise, especially without a birth name. If we look here, at least part of the mystery is solved. His ordination and at least some of his degrees come from the Universal Life Church, where I could fill up a shopping cart right now with a range of doctorates. For $29.00 I can be a Doctor of the Universe. No really. So, Singing Bear's credentials seem a little dodgy. But you know what else I notice? If we look here at his services listing, there's something else missing in terms of credentials and it seems particularly germane to this case. Nowhere does it say anything about him offering or having any experience with sweat lodges. Just being generically Native American is not enough. Being of some Native American lineage does not automatically confer on a person the necessary knowledge and wisdom to know how to assemble and run a sweat lodge. I've added Tragedy in Sedona to the bookstore. I found the interview with former Ray student Connie Joy very compelling. More information on her extreme learning experience can be found here. 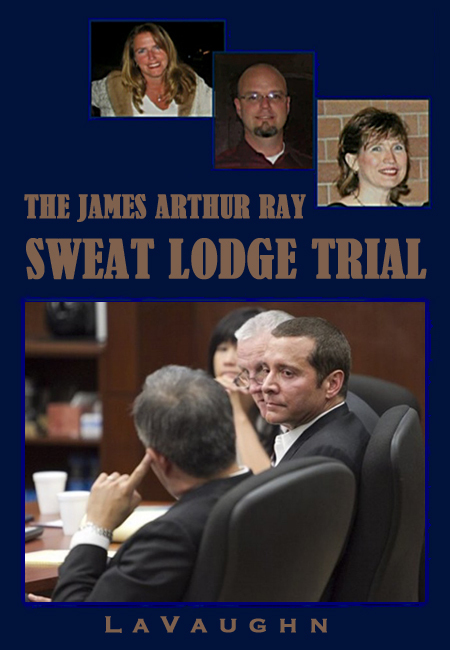 The Joys, whose long history with Ray includes the 2007 sweat lodge, make some very damning claims that will apparently not make it before a jury due to Darrow's exclusion of Ray's prior bad acts. Ray, she said, was a charismatic man who seemed genuinely interested in the people around him, but he developed a Messiah complex. She and her husband endured a sweat lodge ceremony in 2007. No one died then, but many became ill, including Connie. "The sweat lodge was ridiculously hot for way too long," she said. Richard Joy added, "All it was was an endurance test. We had no altered conscious state; it was an endurance test and it was a miserable time." He explained why he was able to stay inside the tent for several hours, "I was able to tolerate a little more. I made sure I was on the edge of the tent and close to the ground, using my head to survive."